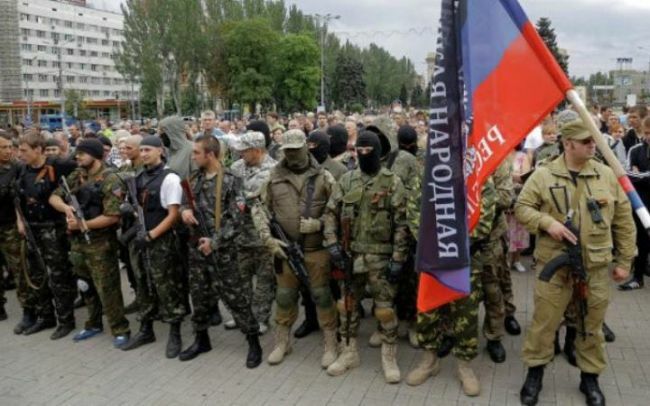 The military command of the Donetsk and Lugansk People’s Republics (DPR and LPR) have reorganized some subdivisions of the self-defense forces and established a united army, Dmitry Tymchuk, Coordinator of the Information Resistance Group, member of the Supreme Rada, has posted on Facebook. “Although the territories have been divided into DPR and LPR, their military forces have been re-built and have a well-defined structure, including in the field of operation and administrative management. They pursue a single plan and a single idea,” Tymchuk wrote. According to him, measures are being taken on the frontline to upgrade the combat efficiency of the troops, to supply military hardware and weapons, and manpower. According to Tymchuk, the leadership of the DPR and LPR army is preparing for a possible attack by the armed forces of Ukraine. Earlier, President Petro Poroshenko accepted that the DPR and LPR have pulled back the greatest part of the heavy weapons from the Line of Contact in conformity with the Minsk Agreements. Speaking on the Ukrainian television on March 9, Poroshenko said they are establishing a layered defense system in the east of the country. The Ukrainian president said Kiev looks to return the Ukrainian weapons left in Crimea.